MANP strengthens nonprofits throughout the state by providing professional development programs and educational resources to nonprofit executives, staff, board members and volunteers. 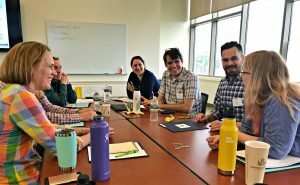 Built on the foundation of the Guiding Principles + Practices for Nonprofit Excellence in Maine, MANP’s educational programs provide professional development pathways to individuals at all levels of experience. Trainings + Webinars: We offer Trainings + Webinars on a wide range of topics in locations across the state. Get more background or browse our offerings by category, date or location. Conferences + Learning Intensives: We have a variety of educational programs designed to help nonprofit leaders and staff explore specific topics in more depth, such as our Board Boot Camp, Nonprofit Finance Conference, Leadership Institutes, and an online certificate in nonprofit management. MANP offers training on a wide variety of topics in a variety of formats and locations. Browse all scheduled MANP events. MANP has an extensive collection of free resources on a wide range of nonprofit management topics available in our searchable Answer Center. We also provide guidance on starting a new nonprofit in Maine, and publish research and guides on topics such as board governance, financial management, nonprofit compensation, and organizational self-assessment.